New York City at the turn of the 20th century was a pretty pungent place. Piles of garbage, millions of people cooking food, and about 2.5 million pounds of horse manure emptied into the streets per day will do that to a city. And don’t forget the 420,000 gallons of horse urine flowing through the streets each week. But some forward-thinking New Yorkers had an idea to clean up the city: establish a citywide central vacuum system. The August 1922 issue of Science and Invention magazine proposed this innovative vacuum system for the Big Apple and claimed that it would save the city hundreds of thousands of dollars. The magazine claimed that the new system — which could be run privately, or preferably managed by the city — would also eliminate many diseases and drastically cut the mortality rate. Science and Invention explained that the vacuum pipes needed for such a system wouldn’t be so different from the water and gas pipes that were already running through the streets. In fact, it would be no more intrusive to the environment than the existing system of fire hydrants. The vacuum cleaner terminals along thestreet will resemble our present fire hydrants,and in one scheme it is suggested that streetcleaners will draw the dirt and dust from the pavements and streets by means of long hoses, on the ends of which will be fitted suitable metal mouths, similar but larger than those now used in the home vacuum cleaner. A second scheme which has been suggesteddoes away with all personnel, the suctionaction being automatic and continuous orsemi-continuous. But it wasn’t just the streets that would benefit from this new city-wide vacuum system. The homes of tomorrow would be able to plug right in as well. Houses will then be connected to the central vacuum system, and besides utilizing this great convenience for the purpose of cleaning thecarpets in our apartment, we will no doubthave vacuum ice-boxes, vacuum firelesscookers, vacuum fly exterminators attachedto chandeliers, etc., to draw all flies and other insects out of the air in the room, not to mention vacuum dish driers for milady’s boudoirs, smell exhausters to place over the kitchen ranges and air circulating registers, causing a draft or movement of the air in a room similar to that effected by the electric fan. 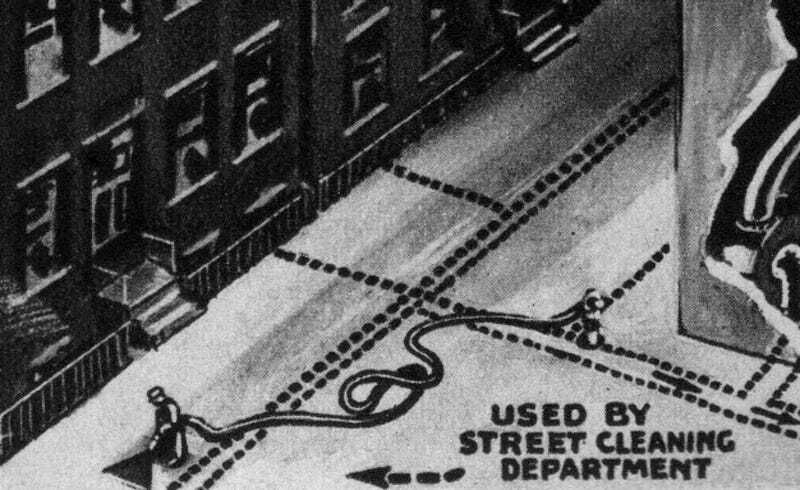 Needless to say, New York never got its central vacuum cleaning plant — though they did install a less ambitious system under the streets of Roosevelt Island. One reason it wouldn’t be tolerated in our modern era might be the magazine’s plan for getting rid of all that waste once it got to the nearby facility for processing: they were going to burn it. I can’t imagine that “setting it all on fire” would’ve been a winning strategy for improving the smell of New York.